The U.S. Environmental Protection Agency on June 30 issued its latest round of designations for sulphur dioxide (SO2) emission standards set in 2010. EPA identified 61 areas in 24 states, finding four areas not in compliance with the regulation, 41 in compliance, and 16 areas unclassifiable. The four "non-attainment" areas were near the Alton Steel plant in Illinois, the Marion Power Station in Illinois, the Wagner coal plant near Baltimore, Maryland, as well as the St. Clair and Belle River coal plants in Michigan, both included in one area. Sulphur dioxide is a byproduct of burning coal and can cause acute respiratory problems, especially in at-risk populations. Under the National Ambient Air Quality Standards, EPA set a 1-hour standard for SO2 at 75 parts per billion. The designations are the second of four rounds the EPA must complete under a 2010 court order. EPA released the first list of locations in February and must complete the final two rounds by December 31, 2017, and December 31, 2020. The SO2 regulations are a part of a larger initiative by the Obama administration to strengthen public health and environmental protections involving air pollution — a push that includes tightened standards for ozone, particulate matter, carbon and other pollutants. But SO2 is different from those other emissions in one important way. While ozone and particulates can come from a variety of sources, SO2 comes almost exclusively from burning coal, either to generate electricity or fuel industrial operations. That means the agency can pretty well determine the point source of pollution in an area with heightened SO2 levels. 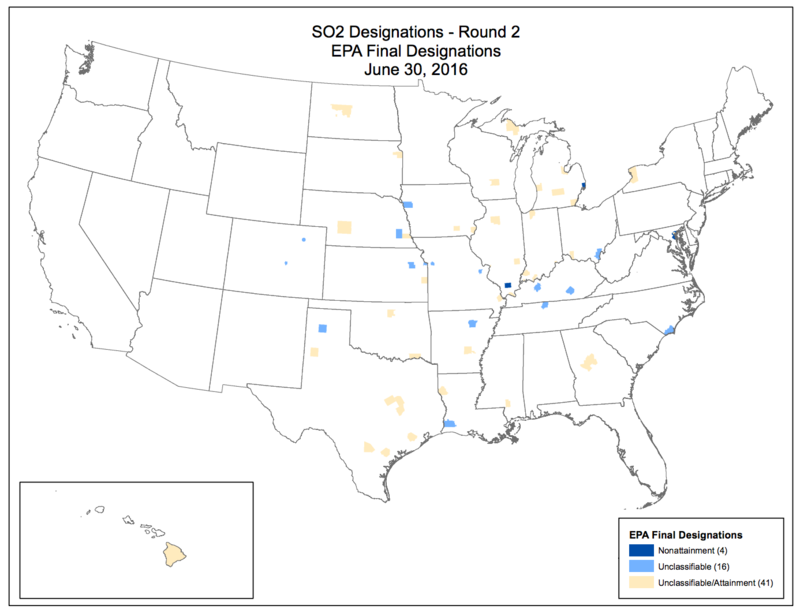 In February, EPA issued non-attainment designations for 12 U.S. counties under the rule. That list included areas with violations of the 75-ppb standard set in 2010, along with areas with ​existing power plants that were in non-attainment with the standard and were not retired by March 2015. Including previously-identified plants, more than 66 GW of generation were included. Energy Future Holdings, Xcel, Dynegy and NRG Energy all had multiple plants identified as problem polluters. Last week's designations included a shorter list of violators, listing four electricity generators and one industrial plant as contributors to unsafe levels of SO2. Plants can reduce their SO2 emissions with the addition of scrubbers, but that technology is costly. States with areas of non-attainment must submit plans to comply with the air quality standards to the EPA, and the agency will implement a federal compliance plan if they fail to do so. In March, EPA reported that 11 states failed to submit plans under the first round of designations, though they have until October 2018 to do so. Already, some critics are pushing back against this round of SO2 standards. Maryland Gov. Larry Hogan (R) said last month he would challenge the EPA finding involving the Wagner plant near Baltimore, saying the method the agency uses to measure emissions is erroneous. Luminant, a Texas generator, and others made similar claims in the first round of designations. The multiple rounds of designations stem from a 2010 legal challenge brought environmental groups against EPA. The Sierra Club and others pushed the agency to release SO2 designations faster, resulting in a court order that EPA release designations by certain dates. "EPA is designating areas in multiple rounds," a spokesperson wrote to Utility Dive. "The agency has already designated 29 areas in 16 states as not meeting the standards on July 25, 2013. At that time, EPA did not have sufficient information to make a designation determination for all areas of the country. So we proceeded first with designations focusing on those areas where we have complete, quality-assured, certified monitoring data showing a violation of the SO2 standard." Other designation information is available on the EPA site.